The rise of email prospecting has created a great discussion among sales experts – does it work? Previous posts here and here give the background and a “Pro email prospecting” (with the right type of message) viewpoint. Today’s post gives three other viewpoints and some great tips on email prospecting. I’d be surprised if this ever works. There’s no compelling reason why the recipient should respond. Nothing to engage, no tie to any business priority. This is lazy email communication focused on getting what the sender wants without any consideration of providing value to the recipient. And that first sentence is designed to make the recipient feel bad – like they’ve failed to reply when they have been given no reason to do so. Shame on them! Ah, you just gotta laugh, you know? It’s so very sad. Here’s a link to some blog posts Ardath has written about this topic. Sigh….I guess never having been in touch with me and “it’s been a while”are synonymous to this sales person. work in the short term but my rule is that if the activity is something you would be embarrassed about be caught doing. Don’t do it. You will only sacrifice the long term relationship and lifetime customer value. Cold prospecting by email is too passive and not an effective way to build a relationship. Email is a create relationship enhancer especially if the emails you are send are high content and of value to the receiver. routinely saw a 10-11% positive response rate. They were able to replicate this success for over 3 years. Has anyone been exposed to Ari Galper’s Unlock the Key program? It’s all about building relationships with prospects based on trust, etc…he would call this an example of “hope-i-um”, meaning you lob the communication over the wall and hope it works! We provide this type of prospecting service for our clients -and I can tell you, if there is a lack of personal engagement (especially in B2B sales) like this is a perfect example of, your results and ROI will be disappointing at best. Pick up the phone and show you care. 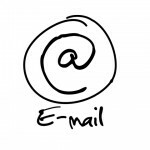 Use email as partof a larger nurture/touchpoint strategy, not THE strategy. Make the message focused on THEM, not you and why you can’t call, haven’t been touch, etc. Ensure the message is value focused, not feature focused. Don’t expect your prospect to take actionor do YOUR work – give them good information and how you will follow-up with them. What tips do you have to share with the rest of us? Help us all learn! Thanks for including me in your post! Email is bad more often than it’s good. Unfortunately. You’re absolutely correct with your tips. My friend on Orkut shared this link and I’m not dissapointed that I came here.